The Accidental’s album, Odyssey was one of the heavy rotations featured artists last school year. I really enjoyed the couple of songs I heard in the station and played on my show, “Porch Culture” and explored more of The Accidental’s music afterwards. The Accidentals are an American band formed in Traverse City, Michigan in 2012. As a three-person band, their music is characterized as indie rock and indie folk. While the band’s tune gives off folk vibes, there’s definitely an incorporation of pop and alternative accents, as well. Odyssey is an alternative mix of slower and fast-paced songs that feels like very down-to earth and authentic music. Some of the song highlights on the album are “Odyssey”, “Arizona Stars”, and “Crow’s Feet.” “Odyssey” has a bit faster of a tempo, whereas the other two songs are slower, featuring strong instrumentals in the background. “Crow’s Feet” is the longest song on the album clocking in at around six minutes, and has melodic tune. It would be perfect for a deep scene in a romantic movie (my favorite!). However, I have to say that “Arizona Stars” is the best song on the album, as it starts with some folk vibes that carry through the song, and features some real catchy lyrics. 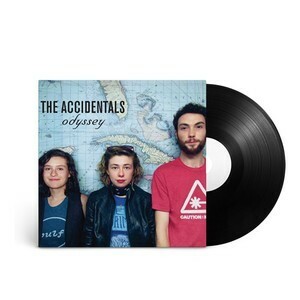 Check out The Accidentals and their album Odyssey – you won’t regret it!